ln C = -kt + constant where ln C is the natural logarithm (base e) of the concentration. Therefore, if ln C is plotted against t, as shown in Figure 2, the plot will be a straight line with an intercept (at t = 0) of ln C0, and the slope of the line (m) will be —k. 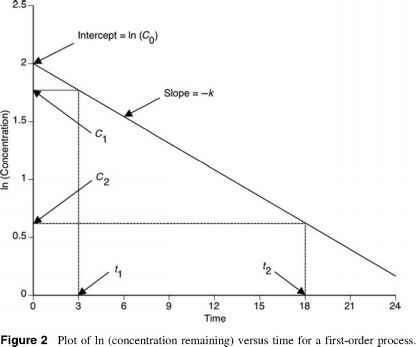 Such plots are commonly used to determine the order of a reaction; that is, if a plot of ln C versus time is a straight line, the reaction is assumed to be a first-order or pseudo-first-order process. Example. A solution of an ester in pH 10.0 buffer (25°C) one hour after preparation was found to contain 3 mg/mL. 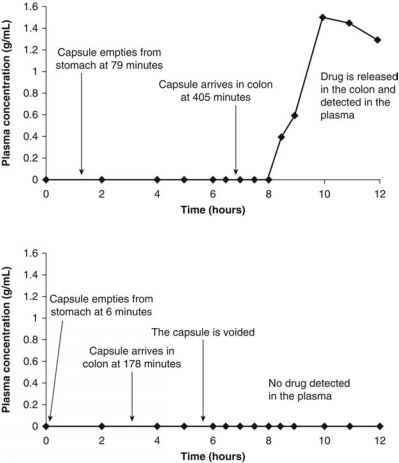 Two hours after preparation, the solution contained 2 mg/mL. Calculate the psuedo-first-order rate constant for hydrolysis of the ester at pH 10.0 (25°C). Note that since ln C is dimensionless, the rate constant, k, has the dimensions of reciprocal time (i.e., day-1, hr-1, min-1, sec-1). Equation (13) shows that since k is a constant for a given process, the value of t is determined solely by the ratio C0/C. For example, when C0/C is equal to 2 the value t will be the same, no matter what the value of the initial concentration (C0) was. Example. For the ester hydrolysis above (k would C = 1.5 mg/mL?